Thomas H. Watts (1819-92), Attorney General CSA & Governor of Alabama. 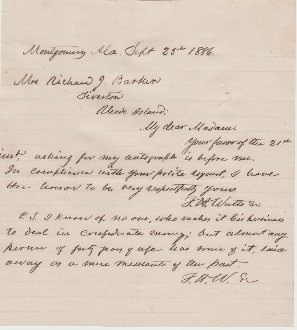 Autograph Letter Signed (ALS), 1 page, 8vo., Montgomery, Alabama, Sept. 25th, 1886, pertaining to sending his autograph and an interesting P.S. dealing with CSA money. "...I know of no one, who makes his business to deal in Confederate money (no longer true), but almost any person over forty years of age has some of it, laid away as a mere momento of the past." The letter is signed once with Watts full name, and once with his initials.